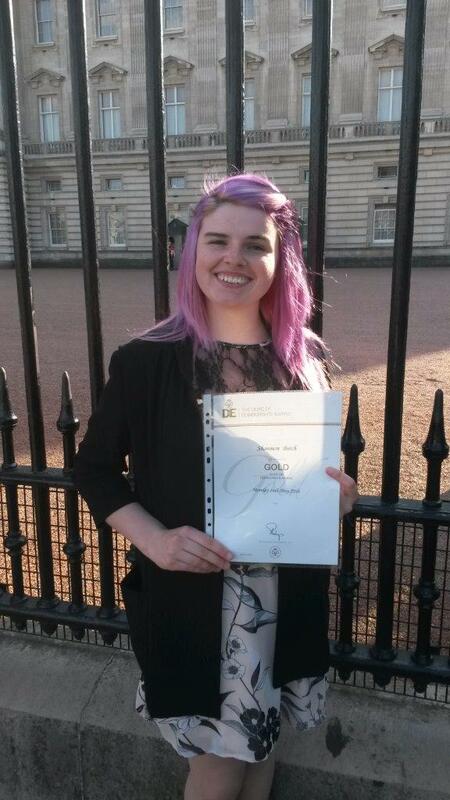 Shannon's story of her day out to receive her Gold Duke of Edinburgh's Award at Buckingham Palace, in her own words. Monday 16th May was a very important and special day for over a thousand young people, including myself, as they celebrated their Duke of Edinburgh’s Award (DofE) achievements and 60 years of the DofE at the Diamond Celebration which took place in the gardens of Buckingham Palace. With over 50 celebrities showing up to hand out Awards, and The Duke of Edinburgh and The Earl and Countess of Wessex also meeting and greeting individuals throughout the day, it was clear this was going to be a really big, special and important event. Arriving at the gates with my personal guest, my dad, we headed through security, past the Palace itself and into the gardens of Buckingham Palace. There are no words for how surreal it felt entering the gates and looking up at the beautiful structure of the Palace and seeing the gardens get closer. I couldn’t help grinning like a fool as I looked at my dad and exclaimed “Dad we are inside the gates of Buckingham Palace!” We were also blessed with brilliant sunshine throughout the day which definitely helped contribute to the high spirits and great atmosphere. It was so strange seeing all these stars walk around the event, have conversations with guests of the DofE and seeing them so natural. It might not seem that big a deal, but seeing them so natural and relaxed without being horded by hundreds of fans just showed how brilliantly set up this event was going to be. I personally was lucky enough to meet and talk with Anton Du Beke (a personal childhood crush/hero) who gave me two huge hugs and congratulated me on my Award, we also discussed cycling in France and the UK. Then I was in awe as I was introduced to Colonel Hadfield (he went to Space! How cool is that!?). We spoke about the DofE, where he grew up and my time working in America. Getting into our groups we were asked to stand in silence and face towards the Palace as the National Anthem was played by the bands to announce the arrival of Their Royal Highnesses. As they made their way around the groups, we were introduced to our guest speaker, Nick Hewer, known for his time on The Apprentice. As we stood in our order to receive our Award he walked down the lines asking us about our Gold expeditions or how far we got with DofE. Getting to me and my friend who also did the bike ride; we shared our experiences of cycling the length of the country and he asked a few questions about the trip. 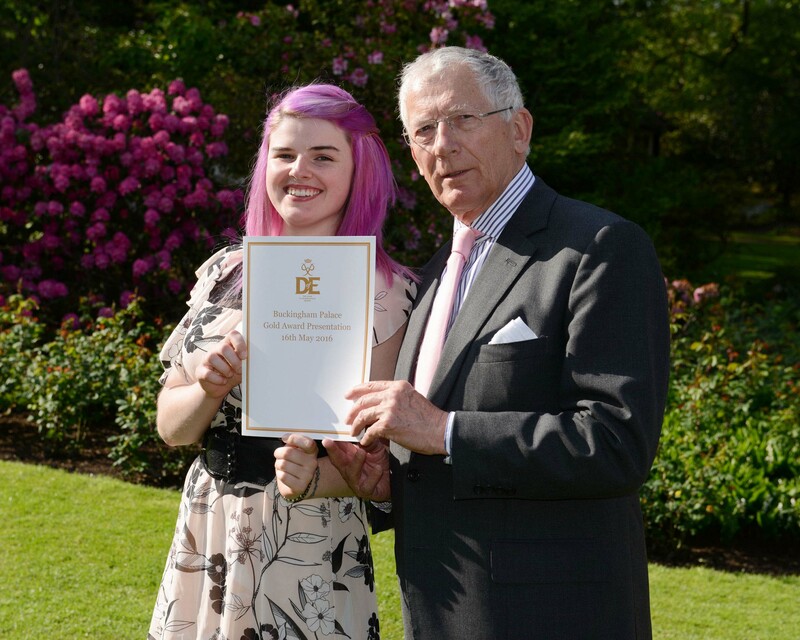 One by one we were handed our Gold certificates by Nick Hewer who congratulated us with a big handshake and a smile. After the young people were given our certificates the Licenced Organisations (schools and providers who give the young adults the opportunity to do DofE) were given special plaques. A lady arrived to announce His Royal Highness was on his way to our group. Honestly I became slightly nervous, I was about to meet the man who created The Duke of Edinburgh’s Award! Absolutely amazing. He arrived into our group and smiled at all of us as he asked if we all walked for our expedition, to which I spoke up and said that Lauren and I had cycled. The Duke of Edinburgh meets @dofeuk Gold Award recipients at Buckingham Palace. I didn’t think anything would come from this, but His Royal Highness walked over to us and proceeded to ask us about our journey, I could not believe it! Asking us where we cycled, I told him we cycled the length of the UK from John O’Groats to Lands’ End, he went on to ask us how far that was and how long we did that for, so I replied saying it was 14 days and 1067 miles. The Duke then laughed (I made The Duke laugh!!) and said “I think you did a bit too much,” before asking us a few more questions. He then congratulated us all as a group and left. Then it was time to go home! What an amazing day and experience this had been, not only had I met two amazing personal heroes of mine, I got to meet Nick Hewer and most importantly, I got to speak to The Duke of Edinburgh himself and make him laugh. All taking place inside Buckingham Palace Gardens. One of the most special places in the UK. One huge thing I took away from this day was that while we were there to celebrate our Awards, we were also there with people we looked up to as role models and idols. People that we gave our own time to love and watch on TV or in shows. But yet here they were, not for themselves but here for us. Here to celebrate our achievement and present us with our well-earned Awards. A true honour in my personal opinion. You can read more about Shannon’s Gold expedition, cycling from John O’Groats to Lands’ End, here.